JUPITER, Fla. – Hello everyone, it’s been a couple months since my last blog, and from then until now A LOT has changed. 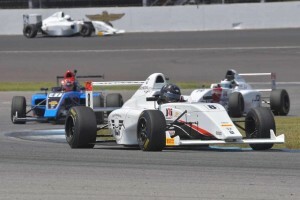 In April, after the opening rounds of the F4 United States Championship Powered by Honda at Homestead-Miami Speedway, it almost seemed like my bad luck would never run out. However, Cape Motorsports and I took that bad luck and turned it around into extreme motivation. Our goal was to not let our 63-point deficit get us down but instead actually take it as a learning curve. We knew we would have to fight back 10 times harder in the next three races at the Indianapolis Motor Speedway. Prior to the Indy event I spent countless hours in a simulator and analyzing any piece of data I could get my hands on. Oliver Askew and I would actually do qualifying stints for hours beating each other’s times over and over again. There was absolutely NO lack of preparation going into IMS. 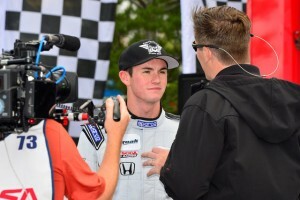 Fortunately for me, the Cape team had raced there just two weeks beforehand with Oliver in the USF2000 series, so their memory was very fresh for IMS and I knew we would have a big head start setup-wise. 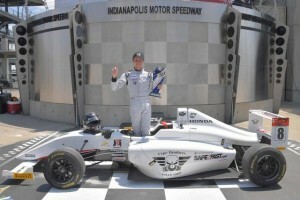 In Victory Lane at Indianapolis. Very cool! When the race weekend began I was consistently fastest throughout the official practices and then grabbed the pole in qualifying. It was definitely a relief knowing all the hard work had paid off and we could once again be back up front after the 40 positions of penalties in Homestead. From then on it was real smooth sailing. I led every lap of all three races with quick time in two of those three. In the points, we went from 63 down to a deficit of only 14, and all the way from 14th in the championship to second, knocking on the door of the championship leader! 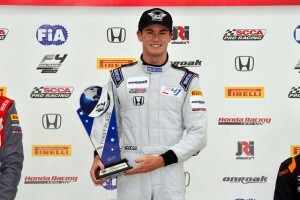 That weekend was a huge confidence boost for myself and the Cape Motorsports team. 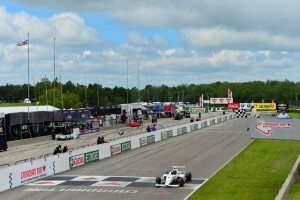 The next event was this past weekend at Canadian Tire Motorsport Park, where we ran in conjunction with the IMSA WeatherTech SportsCar Championship. It was a great event and we kept the motivation going. Once again, I was as prepared as I could possibly be, although it turned out to be as much a guessing game as much as anything else because there was different rubber laid down every session and the weather was always changing. We were very quick in practice but we missed the setup just a little in qualifying. No one else in sight at the finish line at CTMP. We lost around a half-second of time somewhere, which left me very confused and a little worried, even though we qualified third. In the first race, I found that the track conditions had changed a lot, and the line also was a little different due to the high horsepower IMSA DPi and GT cars having been out on the circuit immediately before us. Everyone had to adapt fast and I believe I adapted a lap earlier than everyone, which enabled me to jump from third to first on the opening lap. Unfortunately, we only were able to race four green flag laps due to various incidents and ended the race with a not very exciting green-white-checkered. Nevertheless, that race win put us into the lead of the championship by one point! My nerves from the somewhat poor qualifying were gone and my confidence was back. I started Race Two on the pole, got a great jump and never looked back. There were a couple times early in the race when Dakota Dickerson – another former Team USA Scholarship winner – was almost close enough to make a move due to draft but our car worked far better on the longer runs and we stretched a gap towards the middle of the race. With around five minutes to go a caution came out and that’s how we finished. Six race wins in a row! The third race was very nerve-wracking because we went out right after the three-hour IMSA race had finished amid a heavy rain shower, and from the looks of it, the track was VERY wet. Still, all of the F4 cars were fitted with slick tires. The last thing I wanted to do was end our winning streak by going off by myself! I don’t know how or why but even though the pit lane was really wet when we left the collecting area, the track surface was almost dry by the time we got going. On the start I went into Turns One and Two with a “well, here we go” mentality because they are flat-out corners when the tires are warm and the track is dry. This time it was neither but I needed to build a gap before the back straight where I would be most vulnerable. Fortunately, the car had grip and the plan worked perfectly and I stretched a large gap before it started to rain again and we ended, once again, under caution. So, two weekend sweeps in a row, six wins, many fast times, and 150 points. We now have a handy 31-point lead in the championship. You really can’t ask for much better for that! Even though we’re comfortable where we are, there will not be any slacking and we’re going to keep the ball rolling for Mid-Ohio. I have plenty of track time from F1600 two years ago and F4 US last year, so nothing will be left on the table from start to finish of that event!